Back in September 2011 long-time SWA member Godfrey Bailey called for volunteers to play test a solo board game he had developed called Hill of Doves. The game is set during the First Anglo-Boer War the main action of which was the Battle of Majuba Hill. Amajuba in the Zulu language means the ‘Hill of Doves’. To the Boers Majuba Mountain is known as Spitzkop. I volunteered and was asked to play ten games each in order to find loopholes, errors, ways to break the game or ways to ensure victory. I have to say there were few of the former and none of the last! After getting into my stride I found the game to be a really great game that was extremely absorbing and which presented extremely tricky tactical problems; in fact I was quickly hooked and spent far too much time staring into space trying to calculate the optimal tactics and strategy. And that is the best thing about the game – tactics and strategy. Most games are set at one level or the other; the game is played at the Strategic, Operational and Tactical level simultaneously. This is a very inventive approach and one which makes the game stand out. The other great boon of course is that the game is a solo game. The first time I played I found it a bit fiddly to set up and it took me a long time to play the game through, but that’s natural enough when learning a new game and I spent quite a long time trying to grasp the concepts and get my head around what I was trying to achieve. New players should really check out Godfrey’s website where there are several videos which take the newcomer step by step through the game. This is I think an excellent resource which will help get you into the swing of things more quickly. Once I’d got used to things the game was pretty quick to play – set up is about 15 minutes and you can play a game right through in a couple of hours – that’s a couple of months of strategic game time and at least ten battles on the tactical board. Perfect then for an evening’s play after work or an afternoon at the weekend. So what is the game all about? Well the strategic situation is that the Boers are laying siege to various towns and have an army in an area called Laing’s Nek. The Boers by the way are automated, you play the British. Initially you have a very small force but reinforcements come in as the weeks pass. Essentially the British have to control Laing’s Nek which in the game means controlling ten objectives – farms, hills and so on – on the tactical map. 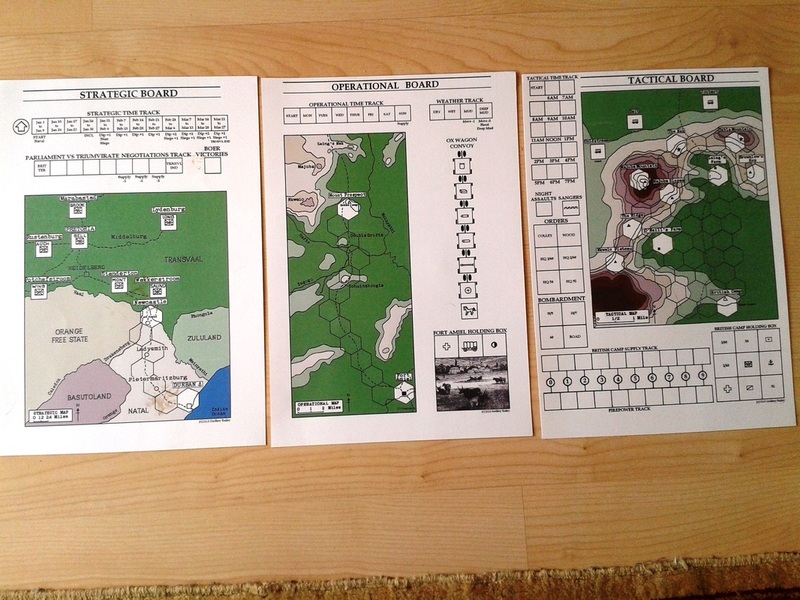 You can see the game boards – Strategic, Operational and Tactical - in the accompanying photo. The Operational map is the key to the game. You are trying to get men and supplies from your base area, Fort Amiel, to your camp (the latter is represented on both the operational and the tactical board). You play through a week day by day, moving men and supplies and trying not to get ambushed by the Boers on the way. You can launch an assault anytime you want, in which case the action switches to the tactical board. Battles themselves are fairly simple but tense. The British form a column – a task force I suppose – which marches on the tactical board from their camp to whichever of the ten objectives you are attacking. Your force is represented by a number of counters – infantry companies mostly but there is cavalry, artillery, gatling guns and so on as well. Each counter is worth a certain number of points; you compare the totals with the Boer counters, roll some dice, refer to a table and see who wins. If you as the British don’t win right away you can throw in reserves and if that doesn’t work you can always gamble everything on a cold steel charge. There’s more to it than that of course but as you can see it’s all pretty straightforward. The Boer forces are generated according to what sort of objective it happens to be and how many supporting positions they have in the area – so while it is possible to guess the likely strength of opposition in any battle, it’s never certain which keeps you on your toes. But the British don’t always have the initiative – the Boers, thanks to the simple but excellent automated system that controls them, can and do launch attacks of their own on objectives that you control, lay ambushes against your supply trains and even attack the British camp. You can’t relax for a second. Once you get to the end of every week you tally up supplies and so on and then you move to the strategic board to see what has been happening in the wider war and on the political front. This aspect of the game is a stroke of genius because it forces you to consider the bigger picture rather than just building up resources and fighting battles. If you are inactive or unsuccessful on the tactical board then you pay the price on the strategic board – either because the enemy take heart and step up their actions elsewhere in the theatre or because the public and politicians at home get fed up with you. So there is a tension built in to the heart of this game – you can’t win quickly because you don’t have enough men or supplies and it takes time to build a preponderance of force; but the longer you take the more the war slips away from you. This is a very difficult game to win because cautious play is punished in the strategic phase while cavalier play is punished in the tactical phase. Victory is possible though so don’t despair; but gaining that victory takes a lot of thought and careful, often tense, play – which of course makes the victory all the more satisfying when it comes. Overall this is an excellent game which forces you to think in a tactical way and make difficult choices. This makes it really interesting and challenging to play. The game does not get stale after a few plays – in fact it continues to be interesting because the tactical problem is so finely balanced. Now to be honest, I’ve never been that interested in colonial warfare and board games have only ever been a sideline for me. Nevertheless I thoroughly enjoyed this game; it is well-constructed and keeps you on the edge of your seat throughout. You are never simply going through the motions as every move requires concentration – otherwise the Boers will certainly catch you napping and you will quickly find yourself losing the war. Highly recommended even if colonial warfare isn’t your thing.